Sunday night the fur was flying on Celebrity Apprentice as the women (Team A.S.A.P.) lost for the third straight week. 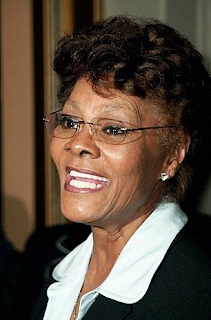 In the boardroom, the claws came out and in the end, Dionne Warwick was fired after sabotaging herself. This week's challenge was to make a 30 second TV commercial for international direct sales company ACN - a provider of video phones. Lil' Jon was selected project manager for Team Backbone and Nene Leakes headed Team A.S.A.P. Team A.S.A.P. chose to do a traditional commercial that played on basic human emotions. A girl had just moved to Paris and her house mother was Dionne Warwick. The girl chatted on the video phone with her father - played by an actor - and her mother - played by Marlee Matlin. Marlee was able to use sign language with the video phone. The men's team rolled the dice and produced a risque commercial that featured an actor in South America talking to his grandparents in the States - the grandfather was played by Gary Busey. The big twist came when the the actor introduced the person he was engaged to - Jose Conseco. Both presentations were made before an audience of 400 ACN top producers and they voted electronically. The men won by a margin of 53% to 47%. Dionne Warwick began drilling holes in her boat when she suddenly exited the editing of the commercial because she was too tired and wanted to go to sleep. Latoya Jackson was also under fire. Nene Leakes commented during filming of the commercial, "Latoya's sweet, but she don't know 1 + 1." When the women were brought into the boardroom, Latoya and Dionne took the most heat. At one point, Trump asked Dionne, "Dionne, who would you fire?" Dionne's shocking response was, "I might as well go with popular opinion and I'd fire me." Star Jones piped up by saying that everyone was there to fight for their charity and you just can't quit. After Jones spoke, Dionne retracted, but it was too late. Trump fired her. Now that the Celebrity Apprentice women have lost for the third straight week, they need to regroup and get focused. If the women's team loses any more players, Trump will be forced to mix up the teams to even them out. Warwick's firing was something I predicted on Facebook before the show. If the women lose again, my money is on Latoya getting fired. If the men lose, Richard Hatch or Gary Busey could be the next ones out the door.